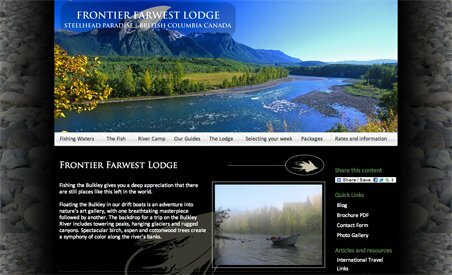 Frontier Farwest Lodge is British Columbia’s “Steelhead Paradise.” Based out of their historic lodge in Telkwa, BC, Frontier Farwest is the only company that offers guided tours on both the Bulkley and Morice Rivers. All of their guided trips use drift style boats and rafts that allow anglers to effortlessly glide through the water. They also have the only river camps on the Bulkley River, which means that they have access to water that few people ever fish. Frontier Farwest’s guides live, breathe and speak fishing. Frontier Farwest Lodge is British Columbia’s “Steelhead Paradise.” Based out of their historic lodge in Telkwa, BC, Frontier Farwest is the only company that offers guided tours on both the Bulkley and Morice Rivers. All of their guided trips use drift style boats and rafts that allow anglers to effortlessly glide through the water. They also have the only river camps on the Bulkley River, which means that they have access to water that few people ever fish. Frontier Farwest’s guides live, breathe and speak fishing. Their knowledge and enthusiasm makes for a truly unforgettable fishing experience.